Police discovered the cause of a fire this week which forced a partial evacuation at the Tropicana Casino in Atlantic City and injured two people. It came from a makeshift methamphetamine lab in a room on the 44th floor. The would-be Walter White was named as Michael Pillar, 49, of Whiting, New Jersey, now facing charges of maintaining a controlled dangerous substance production facility and possession of methamphetamine. Improvised meth labs set up in hotels are nothing new, although they tend to occur in cheap motels rather than a major casino resort. Guess this guy thought he was a classy cooker. 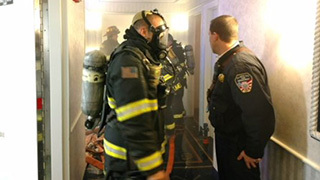 The fire was contained to Pillar's room although it forced the evacuation of guests from four floors. The blaze started in the bathroom and quickly spread, igniting the bed, fire chief Scott Evans said, adding that the sprinkler system had reduced the fire's impact. Pillar and a hotel employee trying to extinguish the blaze suffered injuries, though Pillar had fled the room by the time security and firefighters arrived. Police took him to the hospital after his arrest some 12 hours later.